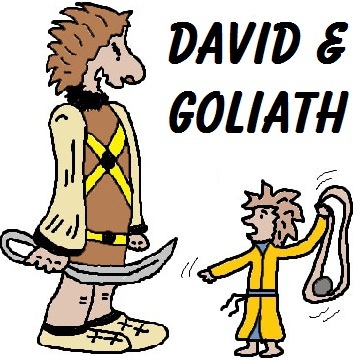 TSH Newsroom: How to be the David who beats Goliath.. According to a 2014 Gallup poll of American SMB (small to medium) business owners, 84 percent would do it all over again if given the chance. And that figure hasn't changed much in 11 years, which includes the Great Recession. Maybe there’s something to that “be your own boss” thing when owning a business after all. Interestingly enough, 90 percent of respondents said securing their financial future was an important or very important motivator in starting their business, yet only 7 percent cited financial rewards/money as the most rewarding aspect of running it. For many of you, you may not be the one running the business but the same benefits exist. When you work for a large company your contributions become all that much harder to measure and see, your level on control is limited. Often you are not the one making decisions affecting your future. All of that is not true in a smaller workplace. Because it offers you a lot more feedback on daily basis as well as a much deeper view of your business and supply chain, being an SMB member offers you some unique rewards. Just a quick note from a client who relayed this story to drive home the point. "Well, that is not really my department you will have to talk to someone else..."
Clearly control and understanding was not really on the list for that company.But lets explore what the benefits of the SMB company you work for really look like. Sometime we don't recognize that if it's not a good fit forcing the solution doesn't make sense, as a SMB member remember that not everyone fits with everyone, so think about moving people around and moving tasks around to make sure the best solution is one that work for both sides. Enjoy being able to seize opportunities as they present themselves. because your business is responsive and the buck stops with you, make intuitive decisions without having to run them past endless committees. Large companies talk about empowering employees, You are there without having to do anything more. Independence to a large extent breeds empowerment. Job satisfaction is high among entrepreneurs and employees in the SMB space. “I have so many different areas to cover: sales, service, marketing, HR, IT, finance, purchasing, training, taxes — and that’s just a short list. " Being an SMB member allows you to stretch your skill levels beyond what you thought was even possible Often SMB employees and owners are asked, Where did you learn all this stuff? you must have multiple degrees and went to school forever , but the reality is typically that you were challenged and you stepped up to the plate, so take a bit of pride in that. Another common reason to show some pride is that you are seen as somebody important to employees, vendors and customers, There is a level of respect comes with being someone who is seen as able to get things done. Lastly you should remember that that the success or failure of your business resides solely upon you and your team. It takes enormous conviction to keep going, even when it gets tough. You really find out who you are and what kind of person you want to be working in a environment that stretches your comfort zone. Its rare to find a small business member who isn't always buried. so when reaching out to other SMB members on the sales and customer service side show them the pride but remember they are in the same boat as well. The power to learn, understand and review all areas of a business is sometimes glossed over. To quote Sir Francis Bacon , "Knowledge is Power". No where is it easier and faster to gain knowledge then in a small business where you can easily move from area to area. The more you know about any area them better you will be able to translate that knowledge into power. The power to do more with what you have and the power to grow. Small business membership isn’t without its challenges, of course, but it’s also full of meaningful rewards. With an SMB business, you create your own job security. and understand that if you help the company you help yourself. its not strictly about the bottom line. Additionally the types of rewards can be radically different, the ability to get that new project going , the aforementioned pride, flexibility, Independence and of course knowledge. and those advantages benefit you both.